Lady Blazers improve to 15-6 on the season. 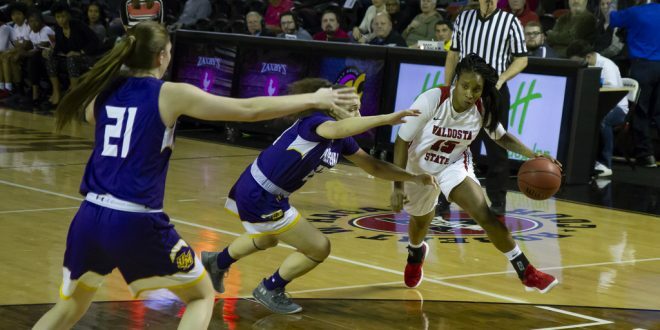 Valdosta State’s 20-4 run in the fourth quarter not only sealed the win for the Lady Blazers but led to an embarrassing 83-44 smack down on the Montevallo Falcons. This was the Lady Blazers’ most impressive win of the year by far, and it was fueled by their previous matchup with Montevallo, when VSU also won 47-38. The team balled out for sure, but Townsend took over, posting a season high 24 points and 12 rebounds for her third double-double. Her fiery play was contagious, and VSU continued to pile on points, even with the game well put away. The fourth quarter was simply overkill. No mercy was shown as they put up 36 points in the final 10 minutes. Even a little salt was left on the wound after Bria Clemmons sunk a three with 23 seconds left. VSU’s defense suffocated Montevallo and scored just 17 points in the second half, with no player finishing in double figures. That defense and hustle led to the Lady Blazers dominating down low. They outrebounded Montevallo by 20 and scored 40 points in the paint to their 12. VSU forward Germani Abram received significant minutes off the bench for Maddy Corazza, after she hit the court hard, fighting for a rebound. Abram was effective on both sides of the ball and posted six points, six rebounds and three blocks. Another notable performance came from point guard Kayla Bonilla. She was all over the court as usual with 12 points, five assists and four steals. She’s now fifth in the GSC for both steals and assists. Now, the Lady Blazers get a breather after the blowout win. They will play again next week. Seven games remain on the final stretch of the season before the GSC Championship, and the Lady Blazers rank fourth in the conference right now. They’ll look to ride their four-game win streak when they travel to Carrollton and play the last team they lost to: West Georgia.